Why we need your employee records? Maintaining employee data and legal employment relationships is essential to comply with UAE employment regulation. 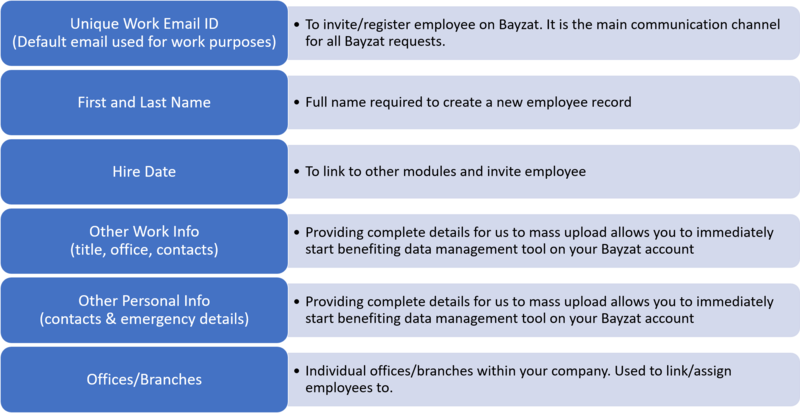 Uploading and creating complete records for you during the configuration stage allows you to immediately start benefiting from the expiry tracking technology and data management tool on Bayzat when you receive your account. Let us go through each of these tabs and the required data points. In this sheet, you can add offices / branches maintained by your company. To upload supporting employee documents, check out our Uploading Configuration Documents article.